This past spring break, my kids wanted to go on an adventure. We’ve already done Disneyland and Legoland, and spent more time in Phoenix and Tucson than I care to admit. Camping was not really an option, as the youngest is just nine months old. Finally, we settled on Las Vegas. Turns out, there is a lot to do there with kids, and most of those cool things are free. Bonus: most of them also appeal to adults! So we loaded up the car, drove to Sin City, and started planning our adventure. On our first day in Vegas, we did quite a lot of walking—a lot. We are big fans of babywearing, so no stroller was required, and the bigs (ages six and eight) were true champs. We set off to the far end of the Strip and started exploring. We walked through several casinos, most of which were really fun to explore. We strolled through MGM Grand, Paris Las Vegas, and Bally’s, and the kids thought the lights and decorations were fun. My daughter was enthralled by the street signs, Eiffel Tower, and a giant hot-air balloon at Paris Las Vegas. The kids absolutely loved exploring M&M’s World. We took pictures and explored all four stories quite thoroughly. The store even had a free 3-D movie in its theater. We easily spent 30 to 45 minutes just looking at all the cool things on display! The street performers were of particular interest to my kids. Once I firmly said we were not taking pictures with them because it cost money, they had a great time just looking at them. They were quite impressed with the musicians and mimes. For kids who don’t live in a big city, watching street performers is a new experience. Even the escalators and bridges over Las Vegas Boulevard were fun for the kids. They could see everything while standing on top of the street. Especially at night, one of their most favorite things to do was climb the escalator and look out over the Strip. That evening we went to Caesars Palace, again enjoying just walking around taking in the sights, and had dinner. While we were waiting for a table, the kids watched the fish in the aquarium inside the Forum Shops. There was also a spectacular show about the fall of Atlantis that played several times, complete with fire and water. They talked about nothing else throughout dinner. Better prepared after our first day, we planned to spend the morning exploring and then return for naps and a swim before dinner. That morning, we explored the New York–New York Casino and Hershey’s World, another place my children absolutely loved. They took pictures inside a giant Reese’s peanut butter cup, and I treated them to their first piece of genuine New York–style pizza. That evening after dinner in the Venetian, the children asked lots of questions about gondolas and Venice before I distracted them with watching sweet treats being made at Carlo’s Bakery. With all the cooking shows kids watch, they really enjoyed that. Then we hit the Strip for evening entertainment. We started with Treasure Island, where we spent time pretending to be pirates and comparing the pirate ships on display out front. We then donned our superhero disguises and played around at the Marvel Avengers S.T.A.T.I.O.N. After that, we went outside and caught the volcano show at The Mirage and walked down the Strip toward the Bellagio. The fountain show at the Bellagio is my absolute favorite part about Last Vegas. I could do nothing else but sit there for hours and watch it. When we were walking down, the kids saw the fountains in front of the Wynn and thought they were cool, so I knew they’d enjoy them. They loved it! For our third and final day in Las Vegas, we wanted to make sure we had enough energy for a show that evening. So we left the Strip and went to Fremont Street. (In full disclosure, first we went to the Las Vegas Children’s Museum, which was not free but well worth every dollar. The kids did not want to leave.) Fremont Street was fun to drive down, as we could see its history in the old buildings. Parking was cheap and easy to find, and we walked a few blocks to the Container Park. This area is completely made of shipping containers. Restaurants and shops surrounded an open area, similar to a quad at a college campus. In the middle is this huge playground, complete with slides and a tree house. The area is fenced in and has a supervisor there making sure children do not exit without the right adult. This was a huge bonus for us. While we ordered and ate lunch, the kids could play freely and safely. In another area, the kids built a fort with life-sized Legos. We spent about two hours there, and everyone enjoyed it. 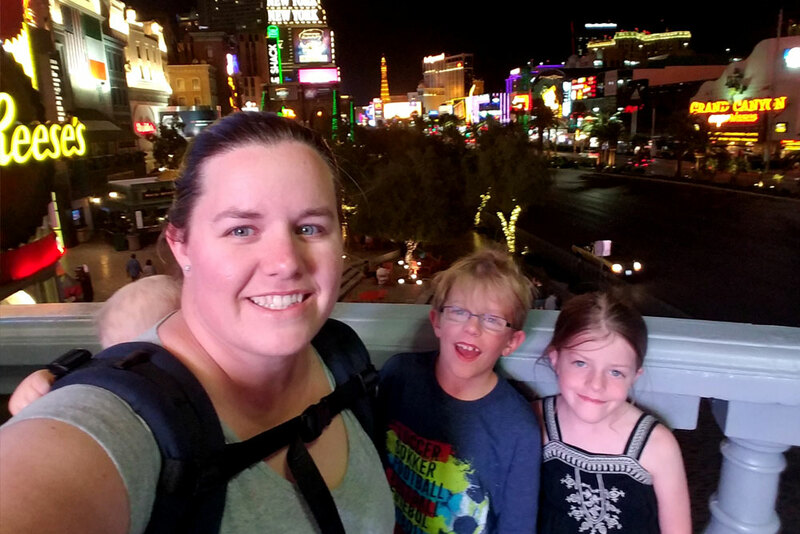 Each time someone asks me what we did for spring break, I get excited to tell them all about our affordable, family-friendly trip to Las Vegas. They are surprised to learn just how much there is to do for and with kids, and even more surprised at how much of it is free. Take your kids to Las Vegas the next time you get the opportunity; everyone will love it!